SPECIAL OFFER! 20% off, only £41.17! 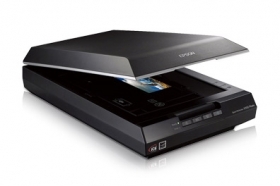 The Perfection V550 Photo is the versatile photo scanner that gives your old photographs a new lease of life. You can easily scan a range of negative and positive film - up to medium format - and use Digital ICE® Technology and Epson Easy Photo Fix software to transform your old photos into crisp, clear digital images, all in a matter of moments. The built-in transparency unit allows you to scan two 35mm filmstrips (12 frames) or four 35mm mounted slides at a time and also supports medium format film. You can also scan up to A2-sized pages, such as large photos, newspaper articles, posters etc. with ArcSoft® Scan 'n' Stitch Deluxe™ software.